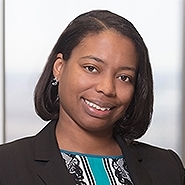 Lewis Rice member Charla M. Claypool discusses her inspiring path to becoming a lawyer in the American Bar Association's guest column, "Beating the odds, lawyer mentors at-risk youth." Additionally, Charla discloses her passion for mentoring and guiding our youth, especially at-risk young women. Charla focuses her practice in the areas of intellectual property and advertising, promotions, and social media law. She has significant experience advising clients on legal issues related to advertising, endorsements, loyalty programs, and consumer promotions, including issues involving conduct of such initiatives via social media.